Our chauffeur drive service caters for all your transportation needs when you are visiting the Maltese Islands. Whether you are travelling for pleasure or business we are able to offer you most competitive rates at the highest level of customer service! We provide you with fully airconditioned cars and minibuses to ensure that even in summer you are travelling in comfort and style and arrive at your destination, relaxed and on time! Our speciality is what we call ‘Go as you please’. It is a great way to see whatever you wish, you call the shots and tailor your own day out. 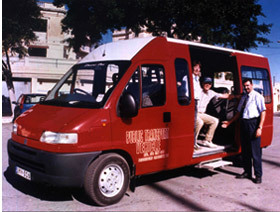 Whether you want to take the mainsites or the beaten track, we will provide you with a chauffeurdriven car or minibus and you tell us where you want to go, or want to do, with a driver with a good knowledge of the Maltese Islands! Whatever your requirements, you e-mail, call us or send us a fax and we will provide you with all your needs. All our chauffeurs are fully licensed and experienced to give you the highest standard of service.